Heartburn happens when stomach acids enter the stomach and irritate the nerves in the esophagus, causing a painful burning sensation. There are many ways to approach eliminating heartburn, including routine changes, dietary changes or solutions, over the counter and prescription medicines and surgery, in extreme cases.
? Instead of sleeping lying flat, try propping yourself up with a few pillows, or sleeping in a chair to nap. Gravity prevents acids from escaping the stomach, and lying prostrate can allow them to creep into the esophagus where they don?t belong.
? Don?t smoke. Smoking has been shown to cause heartburn, in addition to other serious health problems.
? Lose a few pounds. Added weight on the chest or abdomen puts strain on the stomach, causing acid reflux.
? De-stress. Stress can encourage stomach acid production. Something as simple as taking a few deep breaths can help prevent the onset of heartburn in the near future.
? Don?t eat large meals. Try smaller, more frequent ones. Large amounts of food bombard the stomach causing pressure and acid to accumulate.
? Watch the foods you eat. Certain foods can trigger heartburn. Common ones include onion, caffeine, garlic, alcohol and citrus. Keep track of what sets you off and avoid those foods.
? Drink a cup of fennel or chamomile tea. When sipped, it has been shown to soothe or prevent heartburn.
? Take ginger. All three forms ? pills, tea and candied ? can help relieve heartburn pain.
? Drink a glass of water. It will help flush the stomach of excess acids.
? Eat an apple. Some people have had great success with just a few slices.
? Apple cider vinegar can help with both prevention and treatment of heartburn. A few tablespoons, though bitter, will help soothe heartburn pain. When added to water and taken before a meal, it will help prevent it altogether.
? Many over the counter medicines, like Tums and Mylanta, can help alleviate heartburn, and some even come with the added benefit of an extra dose of calcium.
? Prescription medications can help target the specific thing causing heartburn. o For example, drugs like Nexium, Prilosec and Pepcid block the production of acid. This helps people with too much stomach acid. o Foaming agents help coat the stomach and protect it from damaging acids. o Drugs like Relgan can help move things through the digestive system and strengthen esophageal muscles. Surgery is often a last resort. Most people will be able to find a solution or combination of things to solve their heartburn problems. However, if severe enough, a procedure called fundoplication can be performed. It involves using a portion of the upper stomach to help tighten the esophageal muscles, thus preventing acid from getting into the esophagus. Surgery for heartburn is rare, and generally a more natural or medicinal approach is recommended. 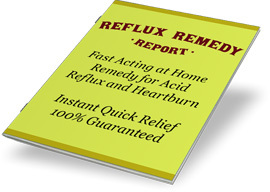 For another resource on curing your heartburn, please reference our Reflux Remedy Report.